The DKN Xg10 Pro Vibration Trainer is the newest model that makes Intensive Vibration Training exercise accessible and affordable.The unique, sleek design, and the compact size of this machine, occupies less floorspace, fits into any fitness studio or wellness centre. The DKN Xg10 Pro Vibration Trainer has a well balanced platform, a low entry step, and a great power range, reaching an incredible 11G (loaded!). The DKN Xg10 Pro Vibration Trainer comes with 2 upper-body straps, a thick high density mat, an interactive training DVD, a personal traning guide and an exercise poster. The greater frequency range, in between 20 to 50 Hz, with interval steps of 5 Hz, modulable 3.8 mm amplitude, the touch screen, backlighted panel, with DKN’s integrated virtual coach, 3D visualising graphic exercise positions, and with 12 integrated programs: the DKN Xg10 Pro Vibration Traine matches intensive exercising for group classes, as well as individual training. 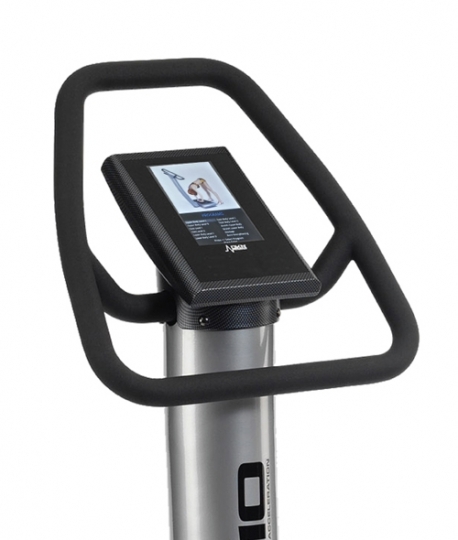 Order your DKN Xg10Pro Vibration Trainer from FitnessZone.com today! Chat with one of the friendly agents at FitnessZone and learn more about the DKN Xg10Pro Vibration Trainer. The DKN Xg10 Pro Vibration Trainer is constructed with 100% high grade steel, reinforced with carbon fibre, to control the high performance acceleration. This machine is concepted for intensive home as well as professional use. The DKN Xg10 Pro Vibration Trainer is an innovative new model of the high intensity vibration exercise machines designed to help burn fat, build lean muscle, and improve overall health in just minutes a day. With its state of the art 12G acceleration motor, silent performance and variable frequency vibration, the Xg10 Pro delivers powerful results at the touch of your finger. Whole body vibration provides unmatched fat burning efficiency, allowing the muscle tissues to contract and relax thousands of times per second. The repetitive tension delivered by the DKN Xg10 Pro Vibration Trainer engages the entire body's musculature at once, helping to dramatically improve your strength, reflexes and endurance, while simultaneously increasing blood circulation, collagen production and a more healthy metabolism. The DKN Xg10 Pro - Vibration Trainer was specifically developed considering the professionals: this model makes Intensive Vibration Training exercise accessible and affordable for professional or home use. Making it super easy for you to workout! 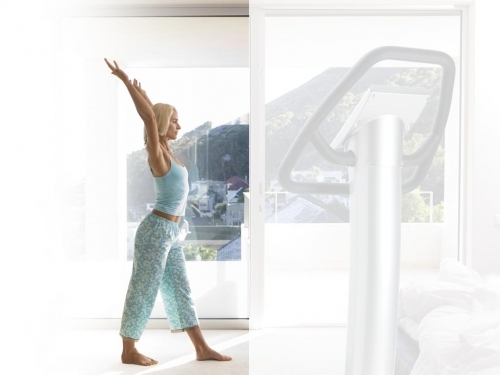 The unique, sleek design, and the compact size of this machine, occupies less floorspace, and fits into any fitness studio or wellness centre. The DKN Xg10 Pro Vibration Trainer has a well balanced platform or also known as vibro plate, a low entry step, and a great power range, reaching an incredible 12G. The DKN Xg 10 Pro comes with 2 upper-body straps, a thick high density mat, an interactive training DVD, a personal training guide and a vibration exercise poster. 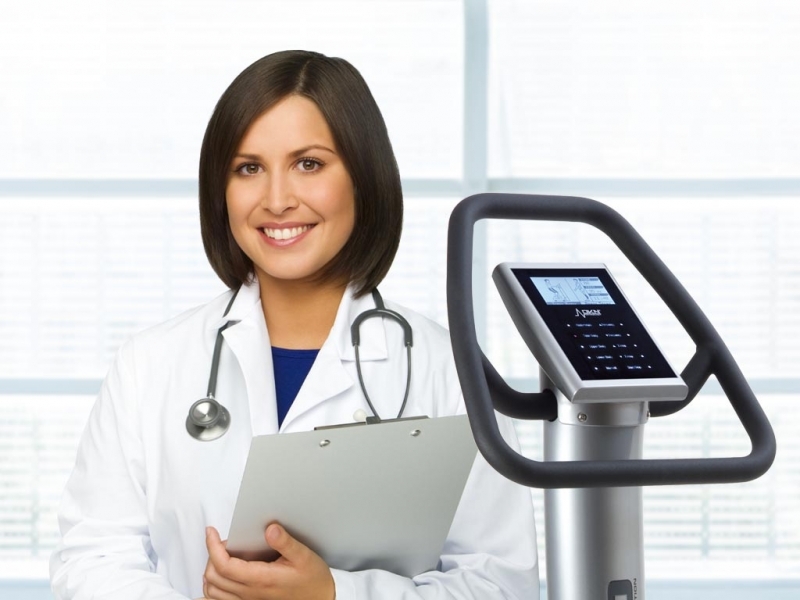 Don't wait to start on the road to a stronger and healthier body call 1-800-875-9145 and talk with one of our FitnessZone agents with any questions you may have about the DKN Xg10 Pro Vibration Trainer. 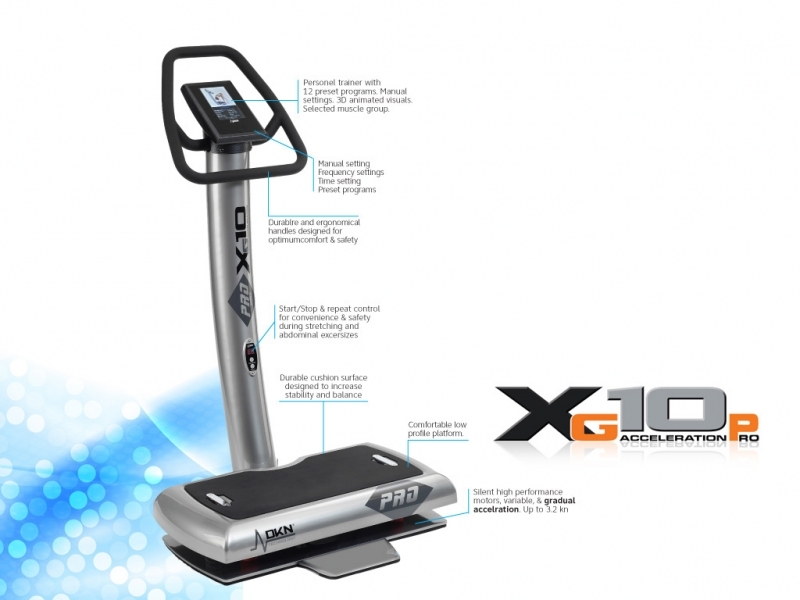 Order your DKN Xg10 Pro Vibration Trainer from FitnessZone.com today to get in the best shape of your life. 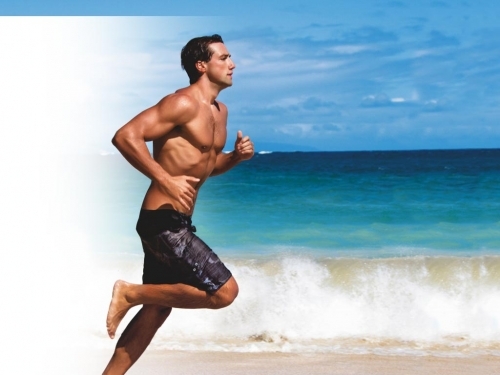 DKN Technology is a global fitness manufacturer with its roots in Belgium. Over the past 18 years, DKN has grown from a small fitness company in Europe to having its products sold in all corners of the world. 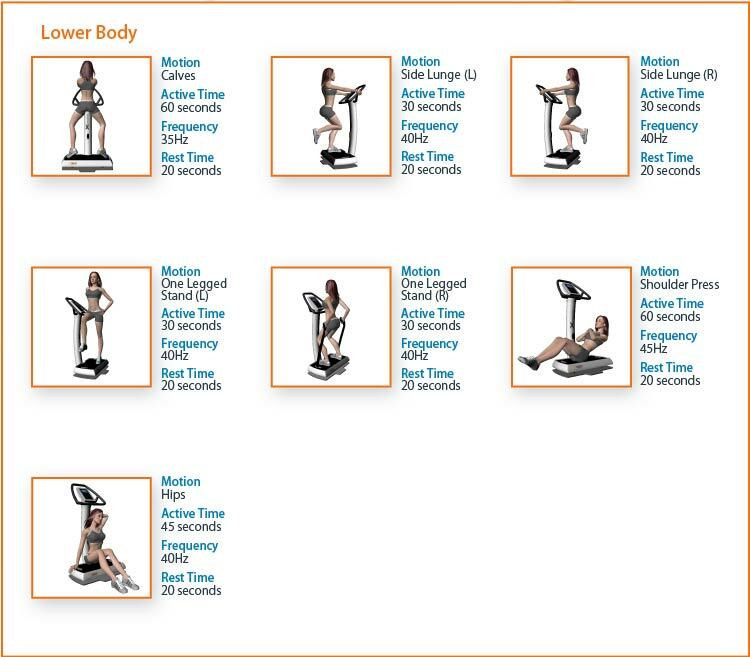 In the USA, DKN has focused on the Whole Body Vibration (WBV) segment of the fitness market. Our goal is to provide machines that will enhance the benefits of WBV and make it easy to use for those new to this modality of training. After years of research, we have created an outstanding lineup of machines that will address all your fitness, lifestyle, wellness and health needs. Being at the forefront of progressive science and technology, the DKN WBV machines accelerate weight loss and quickly reduce body fat and the appearance of cellulite, leaving you with tighter, smoother vibrant skin. Studies have also shown that WBV improves blood circulation, stimulates bone growth, and boosts metabolism. Health experts are turning to WBV to help reduce physical pain and speed up the recovery process of injured muscles. DKN Technology has pioneered the evolution of WBV and continues to explore new premium fitness equipment. Please continue to visit our site in the future for new products delivering the same excellent value as the DKN WBV machines. We invite you to join the DKN-Technology lifestyle today and achieve your fitness, heath, and wellness goals effortlessly. 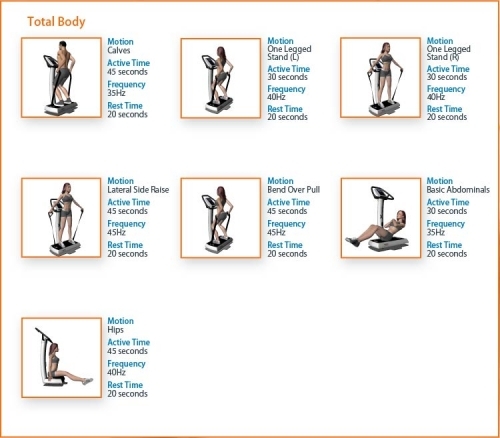 Many studies have demonstrated that a 10-minute exercise on a WBV machine is equivalent and even better than an hour workout with conventional fitness equipment. The impact of WBV is significant in the medical field as positive results have been observed with Parkinson disease patients and patients suffering from other degenerative diseases. For women and elderly people, studies have shown that WBV substantially slowed down the progression of osteoporosis and helped rebuild bone density. Order your DKN Xg10Pro Vibration Trainer from FitnessZone.com today!